This article is about the Lebanese religious group. For the church, see Syriac Maronite Church. For Maronite Christianity in Lebanon, see Maronite Christianity in Lebanon. The Mount Lebanon Mutasarrifate of the Ottoman Empire and later the republic of Lebanon were created under the auspice of European powers with the Maronites as their main ethnoreligious component. Mass emigration to the Americas at the outset of the 20th century, famine mainly resulting from Ottoman blockades and confiscations during World War I, that killed an estimated one third to one half of the population, the Lebanese Civil War between 1975-1990 and the low fertility rate greatly decreased their numbers in the Levant. Maronites today form more than one quarter of the total population in the Republic of Lebanon. With only two exceptions, all Lebanese presidents have been Maronites as part of a tradition that persists as part of the National Pact, by which the Prime Minister has historically been a Sunni Muslim and the Speaker of the National Assembly has historically been a Shi'i Muslim. Though concentrated in Lebanon, Maronites also show presence in neighboring Syria, Israel, Cyprus and Palestine, as well as a significant part in the Lebanese diaspora in the Americas, Europe, Australia, and Africa. The Syriac Maronite Church, under the Patriarch of Antioch, has branches in nearly all countries where Maronite Christian communities live, in both the Levant (mainly Lebanon) and the Lebanese diaspora. The reason for the adoption of the name Maronite is disputed and historians disagree whether it refers to Mar Maron, a 3rd-century Syriac Christian saint, or to John Maron, the first Maronite Patriarch (ruled 685-707). Maronite villagers building a church in the region of Mount Lebanon, 1920s. Our Lady of Lebanon Cathedral Brooklyn in New York City. The cultural and linguistic heritage of the Lebanese people is a blend of both indigenous Phoenician elements and the foreign cultures that have come to rule the land and its people over the course of thousands of years. In a 2013 interview, Pierre Zalloua, a Lebanese biologist who took part in the National Geographic Society's Genographic Project, pointed out that genetic variation preceded religious variation and divisions:"Lebanon already had well-differentiated communities with their own genetic peculiarities, but not significant differences, and religions came as layers of paint on top. There is no distinct pattern that shows that one community carries significantly more Phoenician than another." A number of Maronite historians[who?] assert that their people, along with their non-Christian countrymen, are also the descendants of the Arameans, Ghassanids, Assyrians, and the Mardaites, residents in parts of Caliphate province of Bilad al-Sham, who kept their identity under both Byzantine and Arab authorities. The Mardaites were mountaineers from the Taurus that Constantinople recruited to infiltrate Lebanon and join the Maronites in harassing the Arabs. The resistance movement became known as Marada, meaning rebels. In 936, the monastery of Bet Moroon and other Maronite monasteries were completely destroyed in Syria and the Aramaic/ Syriac Maronites took refugee and joined the Phoenician Maronites and the Mardaites in the mountains of Lebanon. 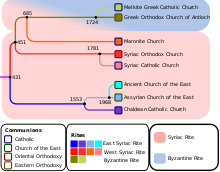 In the 6th century most Maronites were killed by Jacobite Christian Syriacs. Following the Muslim conquest of the Levant, the patriarch[who?] of the Maronites fled to the Byzantine Empire, with his replacement being chosen by the remaining Maronite faithful. 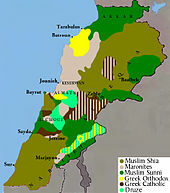 Under Byzantine, or Muslim pressure, the Maronites migrated from the Orontes River valley, in northern Syria, to Mount Lebanon in the late 9th century, where they became "civilly semiautonomous" and were known to speak Arabic in daily life and use Syriac for their liturgy - a scenario that was originally replicated among Christian Arabs even in pre-Islamic times. The Maronites are believed to have settled in the mountains of Lebanon since it provided a refuge for the group, which were viewed as Christian 'dissenters' by the Byzantine church. Historically, this has also been the case for Shi'ites, Druze (who joined the Maronites in the mountains in the 9th and 11th centuries, respectively) and Alawites, seeking havens from Sunni pressure, which dominated the coast. Following the Byzantine conquests of the Orontes valley, by the late 11th century the Maronites were driven out of the valley region and confined to the Lebanon Mountains and a small community in Muslim-controlled Aleppo. The Maronites welcomed the conquering Christians of the First Crusade. Around the late 12th century, according to William of Tyre, the Maronites numbered 40,000 people. During the papacy of Pope Gregory XIII (1572-1585), steps were taken to bring the Maronites still closer to Rome. By the 17th century, the Maronites had developed a strong natural liking to Europe - particularly France. The Maronites have also had a presence in Cyprus since the early 9th century and many Maronites went there following Saladin's successful Siege of Jerusalem. In the 19th century, thousands of Maronites were massacred by Druze during the 1860 Mount Lebanon civil war. The Mount Lebanon Mutasarrifate of the Ottoman Empire and later the republic of Lebanon were created under the auspice of European powers with the Maronites as their main ethnoreligious component. Mass emigration to the Americas at the outset of the 20th century, famine mainly resulting from Ottoman blockades and confiscations during World War I, that killed an estimated one third to one half of the population, the Lebanese Civil War between 1975-1990 and the low fertility rate greatly decreased their numbers in the Levant. Maronites today form more than one quarter of the total population in the Republic of Lebanon. According to the Maronite church, there are approximately 1,062,000 Maronites in Lebanon, where they constitute up to 24% of the population. Under the terms of an informal agreement, known as the National Pact, between the various political and religious leaders of Lebanon, the president of the country must be a Maronite Christian. There is also a small Maronite Christian community in Syria. In 2017, the Annuario Pontificio reported that 3,300 people belonged to the Archeparchy of Aleppo, 15,000 in the Archeparchy of Damascus and 45,000 in the Eparchy of Lattaquié). In 2015, the BBC placed the number of Maronites in Syria at between 28,000 and 60,000. Maronites first migrated to Cyprus in the 8th century, and there are approximately 5,800 Maronites on the island today, the vast majority in the Greek portion. The community historically spoke Cypriot Maronite Arabic, but today Cypriot Maronites speak the Greek language, with the Cypriot government designating Cypriot Maronite Arabic as a dialect. A Maronite community of about 11,000 people lives in Israel. The 2017 Annuario Pontificio reported that 10,000 people belonged to the Maronite Catholic Archeparchy of Haifa and the Holy Land and 504 people belonged to the Exarchate of Jerusalem and Palestine. According to the Encyclopedia of the Peoples of Africa and the Middle East, "accurate figures are not available, but it is probable that the Maronite diaspora of over 3 million individuals is about three times larger" than the Maronite population living in their historic homelands in Lebanon, Syria, and Israel. According to the Annuario Pontificio, in 2017 the Eparchy of San Charbel in Buenos Aires, Argentina has 750,000 members; the Eparchy of Our Lady of Lebanon of São Paulo, Brazil had 501,000 members; the Eparchy of Saint Maron of Sydney, Australia had 152,300 members; the Eparchy of Saint Maron of Montreal, Canada had 89,775 members; the Eparchy of Our Lady of the Martyrs of Lebanon in Mexico had 159,403 members; the Eparchy of Our Lady of Lebanon of Los Angeles in the United States had 46,000 members; and the Eparchy of Saint Maron of Brooklyn in the United States had 33,000 members. According to the Annuario Pontificio, 50,944 people belonged to the Maronite Catholic Eparchy of Our Lady of Lebanon of Paris in 2017. In Europe, some Belgian Maronites are involved in the trade of diamonds in the diamond district of Antwerp. According to the Annuario Pontificio, 66,495 belonged to the Apostolic Exarchate of West and Central Africa (Nigeria) in 2017. With only two exceptions, all Lebanese presidents have been Maronites as part of a tradition that persists as part of the National Pact, by which the Prime Minister has historically been a Sunni Muslim and the Speaker of the National Assembly has historically been a Shi'i Muslim. In 2014, Israel decided to recognize the Aramean community within its borders as a national minority, allowing some Christians in Israel to be registered as "Aramean" instead of Arab. The Christians, who may apply for recognition as Aramean, are mostly Galilean Maronites, who trace their culture, ancestry and language to Aramean-speaking pre-Arab population of the Levant. In addition, some 500 Christian adherents of the Syriac Catholic Church in Israel are expected to apply for the recreated ethnic status, as well as several hundred Aramaic-speaking adherents of the Syriac Orthodox Church. Though supported by Gabriel Naddaf, the move was condemned by the Greek Orthodox Patriarchate, which described it as "an attempt to divide the Palestinian minority in Israel". This recognition comes after about seven years of activity by the Aramean Christian Foundation in Israel, led by IDF Major Shadi Khalloul Risho and the Israeli Christian Recruitment Forum, headed by Father Gabriel Naddaf of the Greek-Orthodox Church and Major Ihab Shlayan. Shadi Khalloul Risho is also a member of the Israeli right-wing Yisrael Beiteinu party, and was placed 15th in the 2015 parliamentary elections in the party's member list; the party however received only 5 seats. The followers of the Maronite Church form a part of the Syriac Christians and belong to the West Syriac Rite. The Maronite Syriac Church of Antioch traces its foundation to Maron, an early 3rd-century Syriac monk venerated as a saint. Before the conquest by Arabian Muslims reached Lebanon, the Lebanese people, including those who would become Muslim and the majority who would remain Christian, spoke a dialect of Aramaic called Syriac. Syriac remains the liturgical language of the Maronite Church. Phoenicianism is an identity on the part of Lebanese Christians that has developed into an integrated ideology led by key thinkers, but there are a few who have stood out more than others: Charles Corm, Michel Chiha, and Said Aql in their promotion of Phoenicianism. In post civil-war Lebanon since the Taif agreement, politically Phoenicianism is restricted to a small group. Akl believes in emphasizing the Phoenician legacy of the Lebanese people and has promoted the use of the Lebanese dialect written in a modified Latin alphabet, rather than the Arabic one, although both alphabets have descended from the Phoenician alphabet. In opposition to such views, Arabism was affirmed at the March 1936 Congress of the Coast and Four Districts, when the Muslim leadership at the conference made the declaration that Lebanon was an Arab country, indistinguishable from its Arab neighbors. In the April 1936 Beirut municipal elections, Christian and Muslim politicians were divided along Phoenician and Arab lines in the matter of whether the Lebanese coast should be claimed by Syria or given to Lebanon, increasing the already mounting tensions between the two communities. Phoenicianism is still disputed by many Arabist scholars who have on occasion tried to convince its adherents to abandon their claims as false, and to embrace and accept the Arab identity instead. 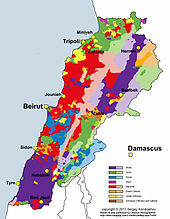 This conflict of ideas of identity is believed to be one of the pivotal disputes between the Muslim and Christian populations of Lebanon and what mainly divides the country to the detriment of national unity. In general it appears that Muslims focus more on the Arab identity of the Lebanese history and culture whereas the older, long-standing Christian communities, especially the Maronites focus on their history, and struggles as an ethnoreligious group in an Arab world, while also reaffirming the Lebanese identity, and refraining from Arab characterization as it would deny them their striving achievement of having fended off the Arabs and Turks physically, culturally, and spiritually since their conception. The Maronite perseverance lead to their existence even today. Lebanese Maronites are known to be specifically linked to the root of Lebanese Nationalism and opposition to Pan-Arabism in Lebanon, this being the case during 1958 Lebanon crisis. When Muslim Arab nationalists backed by Gamel Abdel Nasser tried to overthrow the then Maronite dominated government in power, due to displeasure at the government's pro-western policies and their lack of commitment and duty to the so-called "Arab brotherhood" by preferring keep Lebanon away from the Arab League and the political confrontations of the Middle East. A more hard-nosed nationalism among some Maronites leaders, who saw Lebanese nationalism more in terms of its confessional roots and failed to be carried away by Chiha's vision, clung to a more security-minded view of Lebanon. They regarded the national project as mainly a program for the security of Maronites and a bulwark against threats from Muslims and their hinterland. On an Al Jazeera special dedicated to the political Christian clans of Lebanon and their struggle for power in the 2009 election entitled, Lebanon: The Family Business the issue of identity was brought up on several occasions, by various politicians including Druze leader Walid Jumblatt, who claimed that all Lebanese lack somewhat of a real identity and the country is yet to discover one everybody could agree on. Sami Gemayel, of the Gemayel clan and son of former president Amin Gemayel, stated he did not consider himself an Arab but instead identified himself as a Syriac Christian, going on to explain that to him and many Lebanese the "acceptance" of Lebanon's "Arab identity" according to the Taef Agreement wasn't something that they "accepted" but instead were forced into signing through pressure. Etienne Sakr, of the Guardians of the Cedars Lebanese party, in an interview responded "We are not Arabs" to an interview question about the Guardians of the Cedars' ideology of Lebanon being Lebanese. He continued by talking about how describing Lebanon as being not Arab was a crime in present-day Lebanon, about the Lebanese Civil War, and about Arabism as being first step towards Islamism, claiming that "the Arabs want to annex Lebanon" and in order to do this "to push the Christians out (out of Lebanon)", this being "the plan since 1975", among other issues. The Maronite Christian residents of Jish have recently begun to mainly refer to themselves as Aramean Christian Maronite peoples and not as Arabs or Lebanese Arabs. This status was officially approved in 2014 by the Israeli government and any Maronite Christian can register as ethnically Aramean instead of Arab or unassigned ethnic group. The Maronites belong to the Maronite Syriac Church of Antioch (a former ancient Greek city now in Hatay Province, Turkey) is an Eastern Catholic Syriac Church, using the Antiochian Rite, that had affirmed its communion with Rome since 1180 A.D., although the official view of the Church is that it had never accepted either the Monophysitic views held by their Syriac neighbours, which were condemned in the Council of Chalcedon, or the failed compromise doctrine of Monothelitism (the latter claim being found in contemporary sources, with evidence that they were Monothelites for several centuries, beginning in the early 7th century). The Maronite Patriarch is traditionally seated in Bkerke north of Beirut. Modern Maronites often adopt French or other Western European given names (with biblical origins) for their children, including Michel, Marc, Marie, Georges, Carole, Charles, Antoine, Joseph, Pierre, Christian, Christelle and Rodrigue. Some Maronite Christians are named in honour of Maronite saints, including the Aramaic names Maro(u)n (after their patron saint Maron), Nimtullah, Charbel of Sharbel after Saint Charbel Makhluf and Rafqa (Rebecca). Maronites were persecuted during the Byzantine empire, followed by the Arab invasion of the Middle East (Mount Lebanon) and finally by the Ottoman Empire. The Great Famine of Mount Lebanon, which occurred between 1915 and 1918, was caused by the Ottoman policy of acquiring all food products produced in the region for the Ottoman army and administration, and the barring of any produce from being sent to the Maronite Christian population of Mount Lebanon, effectively condemning them to starvation. It was suggested at the time that the starvation of the Maronites was a deliberately orchestrated Ottoman policy aimed at destroying the Maronites, in keeping with the treatment of Armenians, Assyrians and Greeks. The death toll among Maronite Christians, mainly due to starvation and disease is estimated to have been 200,000. Maronite Christians felt a sense of alienation and exclusion as a result of Pan-Arabism in Lebanon. Part of its historic suffering is the Damour massacre by the PLO. Until recently, the Cyprus Maronites battled to preserve their ancestral language. The Maronite monks maintain that Lebanon is synonymous with Maronite history and ethos; that its Maronitism antedates the Arab conquest of Lebanon and that Arabism is only a historical accident. The Maronites also experienced mass persecution under the Ottoman Turks, who massacred and mistreated Maronites for their faith, disallowing them from owning horses and forcing them to wear only black clothing. The Turkish Ottoman Empire slew upwards of 300,000 Maronites, forced the remaining populations into the mountains (which spawned Mount Lebanon) and let another 100,000 die of starvation while stranded with no means of self-sufficiency. The Lebanese Druze also persecuted the Maronites, and massacred in excess of 50,000 of them in the mid-1800s. However, agreements have been held with the Druze. Moreover, the Maronites later emerged as the most dominant group in Lebanon, a status they held until the sectarian conflict that resulted in the Lebanese Civil War. ^ a b Lebanon - Maronites, World Directory of Minorities and Indigenous Peoples Minority Rights Group International: "Originally Aramaic speakers, today Maronites speak Arabic, but use Syriac as a liturgical language." ^ a b Judith Sudilovsky (2012-06-22). "Aramaic classes help Maronites in Israel understand their liturgies". Catholic News Service. Retrieved 2018-11-18. ^ Daniella Cheslow, (2014-06-30) Maronite Christians struggle to define their identity in Israel, The World, Public Radio International. Retrieved 2018-11-18. ^ a b c Educational Policies that Address Social Inequality: Country Report: Cyprus, page 4. ^ Salibi, Kamal S. (1988). A House of Many Mansions: The History of Lebanon Reconsidered. I.B.Tauris. p. 87. ISBN 978-1-86064-912-7. ^ Moubarak, Andre (2017). One Friday in Jerusalem. Jerusalem, Israel: Twin Tours & Travel Ltd. p. 213. ISBN 978-0-9992-4942-0. ^ Moosa, Matti (2005). The Maronites in history. Gorgias Press LLC. p. 192. ISBN 978-1-59333-182-5. ^ a b c d P. J. A. N. Rietbergen (2006). Power And Religion in Baroque Rome: Barberini Cultural Policies. BRILL. p. 299. ISBN 9789004148932. ^ Maroon, Habib (31 March 2013). "A geneticist with a unifying message". Nature. doi:10.1038/nmiddleeast.2013.46. ^ "History of the Maronites". Retrieved 2018-11-18. ^ Jack Donnelly; Rhoda E. Howard-Hassmann (1 Jan 1987). International Handbook of Human Rights. ABC-CLIO. p. 228. ISBN 978-0-3132-4788-0. ^ Rome and the Eastern Churches (revised ed.). Ignatius Press. 2010. p. 327. ISBN 978-1-5861-7282-4. ^ Michael Haag (9 Jul 2010). Templars: History and Myth: From Solomon's Temple to the Freemasons. Profile Books. p. 66. ISBN 978-1-8476-5251-5. ^ Kamal S. Salibi (2003). A House of Many Mansions: The History of Lebanon Reconsidered (illustrated, reprint, revised ed.). I.B.Tauris. p. 90. ISBN 978-1-8606-4912-7. ^ a b c James Minahan (1 Jan 2002). Encyclopedia of the Stateless Nations: L-R (illustrated ed.). Greenwood Publishing Group. p. 1196. ISBN 978-0-3133-2111-5. ^ a b Ernest Gellner (1 Jan 1985). Islamic Dilemmas: Reformers, Nationalists, Industrialization : The Southern Shore of the Mediterranean. Walter de Gruyter. p. 258. ISBN 978-3-1100-9763-4. ^ Kamal S. Salibi (2003). A House of Many Mansions: The History of Lebanon Reconsidered (illustrated, reprint, revised ed.). I.B.Tauris. pp. 90–1. ISBN 9781860649127. ^ Kenneth M. Setton; Norman P. Zacour; Harry W. Hazard (1 Sep 1985). A History of the Crusades: The Impact of the Crusades on the Near East (illustrated ed.). Univ of Wisconsin Press. p. 91. ISBN 978-0-2990-9144-6. ^ P. J. A. N. Rietbergen (2006). Power And Religion in Baroque Rome: Barberini Cultural Policies. BRILL. p. 301. ISBN 9789004148932. ^ James Minahan (1 Jan 2002). Encyclopedia of the Stateless Nations: L-R (illustrated ed.). Greenwood Publishing Group. pp. 1196–7. ISBN 978-0-3133-2111-5. ^ Lebanon - International Religious Freedom Report 2008 U.S. Department of State. Retrieved on 2018-11-18. ^ United Nations Development Programme: Programme on Governance in the Arab Region : Elections : Lebanon Retrieved 2018-11-18. ^ a b c d e The Maronite Catholic Church (Patriarchate) in "The Eastern Catholic Churches 2017" in Annuario Pontificio 2017. ^ "Syria's beleaguered Christians". BBC News. 2015-02-25. Retrieved 2018-11-18. ^ Maria Tsiapera (1969). A Descriptive Analysis of Cypriot Maronite Arabic. The Hague: Mouton and Company. p. 69. ^ Cyprus Ministry of Interior: European Charter for Regional or Minority Languages: Answers to the Comments/Questions Submitted to the Government of Cyprus Regarding its Initial Periodical Report Retrieved 2018-11-18. ^ Ami Bentov (2014-05-26). "Cardinal is first top Lebanese cleric in Israel". Associated Press. Retrieved 2018-11-18. ^ "Maronites" in Encyclopedia of the Peoples of Africa and the Middle East (Infobase, 2009), p. 446. ^ Ian Traynor (2009-06-23). "Recession takes the sparkle out of Antwerp's diamond quarter". The Guardian. Guardian Media Group. Retrieved 2018-11-18. ^ "Ministry of Interior to Admit Arameans to National Population Registry". Arutz Sheva. Retrieved 2018-11-18. ^ "אנחנו לא ערבים - אנחנו ארמים" (in Hebrew). Israel HaYom. 2013-08-09. Retrieved 2018-11-18. ^ Cohen, Ariel (2014-09-28). "Israeli Greek Orthodox Church denounces Aramaic Christian nationality". Jerusalem Post. Retrieved 2018-11-18. ^ "Identity of the Maronite Church - Introduction". Archived from the original on 2011-10-07. Retrieved 2015-03-24. ^ "Identity of the Maronite Church - A Syriac Antiochene Church with a Special Lit. Heritage". Archived from the original on 2011-10-07. Retrieved 2015-03-24. ^ "Review of Phares Book". Walidphares.com. Archived from the original on 2009-02-10. Retrieved 2009-03-31. ^ The Precarious Republic: Political Modernization in Lebanon. By Michael C. Hudson, 1968. ^ For ever! Lebanon: Its Stand in History Among the Near East Countries By Salim Wakim, 1996. ^ "St. George Maronite Church". Stgeorgesa.org. Retrieved 2018-11-18. ^ a b c Asher Kaufman (2004). Reviving Phoenicia: The Search for Identity in Lebanon. I. B. Taurus. p. 36. ISBN 1-86064-982-3. ^ a b Frank Cass (2003). The Conscience of Lebanon. ISBN 978-0-7146-8378-2. ^ a b Sami G. Hajjar, ed. (1985). The Middle East. E. J. Brill. p. 89. ISBN 90-04-07694-8. ^ "The Identity of Lebanon". Mountlebanon.org. Archived from the original on 2011-07-27. Retrieved 2010-07-26. ^ "Coalition of American Assyrians and Maronites Rebukes Arab American Institute". 2001-10-27. Retrieved 2018-11-18. ^ "Our Lady of Lebanon Maronite Catholic Church". Retrieved 24 March 2015. ^ "Notes on the Question of Lebanese Nationalism". Lcps-lebanon.org. Archived from the original on 2007-10-07. Retrieved 2010-07-26. ^ "The Guardians of the Cedars". Gotc.org. Archived from the original on 2011-07-21. Retrieved 2010-07-26. ^ a b c "Lebanon: The family business – 31 May 09 – Part 4". YouTube. Al Jazeera English. 2009-06-09. Retrieved 2018-11-18. ^ "Interview with Etienne Saqr (Abu Arz)". Global Politician. 2008-01-22. Retrieved 2018-11-18. ^ "Aramaic Maronite Center". Aramaic-center.com. Retrieved 2012-11-26. ^ BBC staff (26 November 2014). "Six unexpected WW1 battlegrounds". BBC News (BBC). BBC News Services. Retrieved 2018-11-18. ^ Ghazal, Rym (2015-04-14). "Lebanon's dark days of hunger: The Great Famine of 1915–18". The National. Retrieved 2018-11-18. ^ Itamar Rabinovich (1986) . The war for Lebanon, 1970-1985 (2nd ed.). Cornell University Press. p. 104. ISBN 0-8014-1870-4. LCCN 85-14891. ^ El-Hāyek, Elias (1990). Michael Gervers and Ramzi Jibran Bikhazi (ed.). Conversion and Continuity: Indigenous Christian Communities in Islamic Lands. Pontifical Institute of Mediaeval Studies. p. 432. ISBN 0-88844-809-0. ISSN 0228-8605. ^ Martelli, Simon (2010-03-07). "Cyprus Maronites battle to preserve rare ancestral language". Dawn. Retrieved 2018-11-18. ^ Moosa, Matti (2005). The Maronites in History (2nd ed.). Gorgias Press LLC. ISBN 1-59333-182-7. Wikimedia Commons has media related to Maronite Catholics. "Maronites" . Encyclopædia Britannica (11th ed.). 1911.